According to Diabetes Care from the American Diabetes Association, Hispanics are higher risk of disease regardless of lifestyle factors, as compared to non-Hispanic whites. This press release only underscores the need for more information in Spanish to Latinos in the United States. Despite slowing growth rates, Latinos still accounted for more than half (54%) of total U.S. population growth from 2000 to 2014. The dispersion of the Latino population across the U.S. has slowed since the onset of the Great Recession. In recent years, the fastest Latino population growth has tended to come in areas with a relatively small number of Latinos. The Hispanic population is not growing in every county of the United States. California continues to have the nation’s largest Latino population among states, but Texas has grown faster. More than half (53%) of the nation’s Hispanics lived in 15 metropolitan areas in 2014. 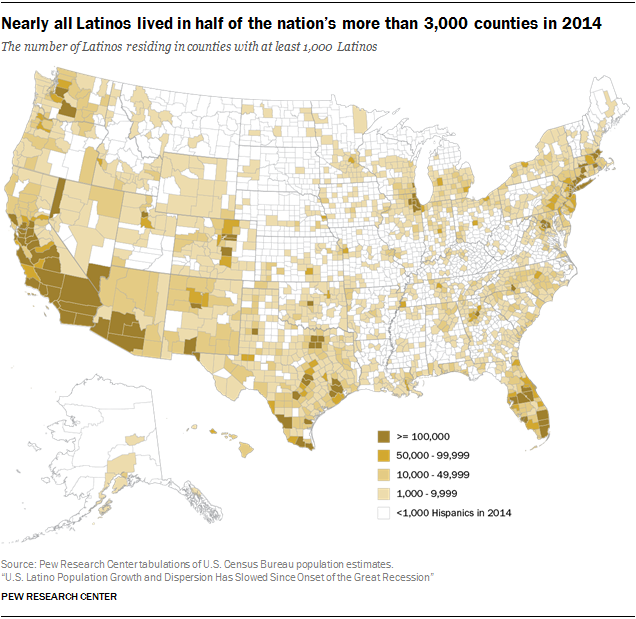 Washington Post discusses Hispanics in the U.S. This is an interesting and informative article by Tracy Jan of The Washington Post. In the article, The Voice of Hispanic Marketing, which is a trade group, in partnership with Nielsen, has identified Latinos earning $50,000 to $100,000 annually as one of the most influential consumer segments since the baby boomers. Furthermore, the buying power of Hispanics has increased according to the Selig Center for Economic Growth.